New Blog Feature – Book Reviews! Hey, this is Jo from Big Country Paranormal and I’d like to introduce a new feature on our blog: book reviews! I’m an avid reader (as are many of our team members) and love to discuss books I’ve read with others of like mind. I thought maybe many of you might be the same. 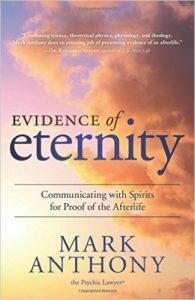 So for our initial entry, here’s my review of “Evidence of Eternity: Communicating with Spirits for Proof of the Afterlife” by Mark Anthony, the Psychic Lawyer. I’ve always had a strong interest in science, particularly quantum physics as it relates to the physical nature of reality; Mark’s use of current mainstream scientific theory to support his explanation for psychic communication provides a solid foundation for the book’s premise. As a paranormal investigator, I’m always on the hunt for the big “W’s.” WHAT are ghosts? WHY do they haunt? WHAT are shadow people? WHERE do EVPs come from? The list goes on and on. After reading this book, I’m now more willing to consider a broader scope of paranormal communications- psychic and otherwise. Mark brings compelling information to the table as the search for answers continues. Has anyone else read the book? Your thoughts? I’d love to hear other opinions on the topic!